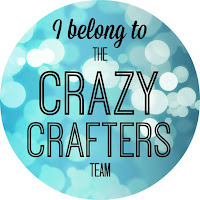 Welcome to the Crazy Crafters Blog Hop for September! You may be just starting the blog hop here at my blog or may have come from the person before me in the list below. If you get off track at any time, the full line-up below will help you move along from blog to blog so you see all the projects. 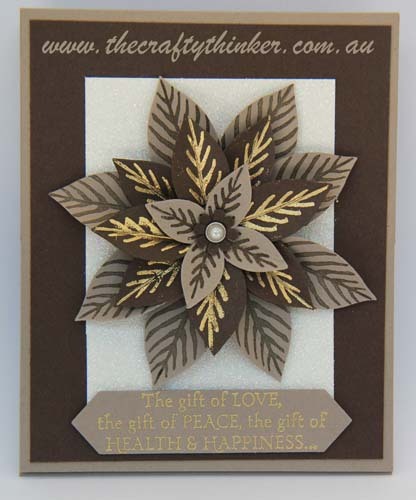 At the moment you are visiting Stephanie Fischer, The Crafty Thinker. This month we are excited to showcase some of the fantastic new products in the Holiday Catalogue - what a feast! Where has the time gone?!! The year is disappearing so quickly and many of us are already well into the joyous swing of Christmas/Seasonal Card production! I love this time of year. Christmas cards seem to not only condone but encourage the use of bling, glitter and glitz and I can be as over the top as I like! 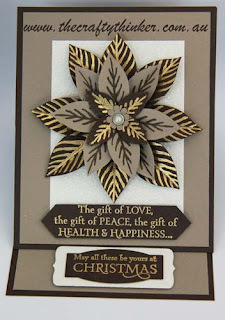 Having said that, the card I've chosen to include in this blog hop is really quite restrained (for me!) and I decided not to use traditional Christmas colours - I think I haven't quite reached the red and green stage of the year yet! For some reason, I'm making a lot of easel cards these days. Maybe because they look quite impressive even though they're so quick and easy to make! 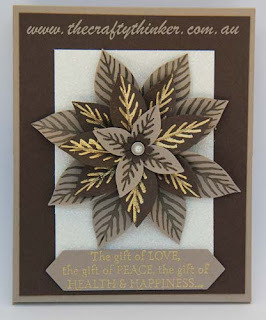 I made the card in Tip Top Taupe and added a panel of Early Espresso followed by a panel of Dazzling Diamonds Glimmer Paper. keep the card propped open. and the other I heat embossed with Gold onto Early Espresso Card. I put a Metal Rimmed Pearl in the centre for a little more restrained bling. The sentiments are from Versatile Christmas - heat embossed in Gold onto Tip Top Taupe card and die cut with the Project Life Cards & Labels Framelits. I "prettied-up" the strip of glimmer paper on the inside by trimming the ends with the smallest of the Deco Labels Collection Framelits. 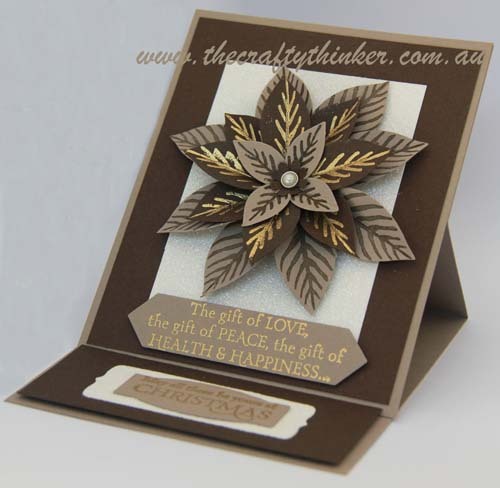 Then I used the other poinsettia to make a second, similar card. Afterwards I wished I'd mixed up the petals even a little bit more. Thanks for taking part in our blog hop, there are so many amazing ideas and so much inspiration that you don't want to miss. Remember that currently you are my blog - Stephanie Fischer - so check the blog hop line up list to see who is next in line in the list and click on their name as you don't want to miss out on seeing any of the blogs and the amazing inspiration they contain. I wouldn't have thought to use this in neutrals, lovely! Wow I love these colours! The colours on this are just stunning! Love the colour combo! Gorgeous!! Love this stefanie. The colours are great. Love this-wouldn't have chosen this bundle-but on my shopping list now! Really love the dimensions on this, lovely card. Fantastic card. I really love that type of card! Must give it a go. The is a very beautiful Card. Love it. Simply stunning. Love everything about this card especially the colours and the fold design. Great choice on the colours Stephanie - it works so beautifully with the builder punch!